No, it didn’t disappeared completely. The ThisTask pointer has been moved (and is used there) to something similar to a thread local storage. It is local, but not local for a thread. It is local to a CPU core. On RPi2 we use four independent local storages and each of them has it’s own ThisTask pointer. Don’t hold your breath, it’s not SMP yet. Far from it 🙂 The scheduler works only on the CPU#0. At least for now. The TLS is used exclusively by the kernel.resource, which knows best about the low-level part of the system. Exec has become two new architecture-specific macros, named GET_THIS_TASK and SET_THIS_TASK(x). On all architectures they do expand to SysBase->ThisTask, on RaspberryPi they expand to TLS_GET(ThisTask) and equivalent TLS_SET. What about the rest of the AROS code? Well, in that case the only sane way to get ThisTask shall be used — the FindTask(NULL) call. And here we come to the point where I’ve killed all nightlies. During my ThisTask removal fun I broke accidentally one macro in AROSTCP network stack 🙂 It should be fixed already. From very beginning I have noticed that the speed of frame buffer was relatively slow. At least not as fast as I would expect form a nearly 1 GHz machine. Well, issue there, ignored first. 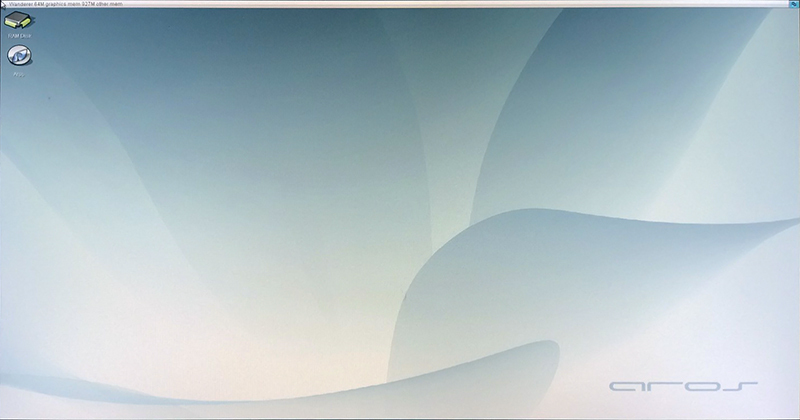 I followed with AROS porting and came to a point where AROS was booting into desktop and running programs. As a simple example I have added Clock to WBStartup folder, thus making this app start automatically once the system is up. Of course I have had full debug enabled in screen console and over serial port. Huh, it took AROS nearly 30 seconds to boot. Not bad, but could be better for sure. Slow redrawing od the screen was worrying me but hey, we do have the simplest graphics driver ever. No acceleration, just a simple portion of memory filled pixel by pixel (with some help of our base graphics class of course). So far so good. Then out of curiosity I decided to take a look at an old raspberry pi model I have on my desktop. I booted it and looked on the Clock and gone mad. Old raspberry pi with arm11 CPU booted in about 20 seconds. 2/3 of RaspberryPi2 speed! Can’t be, I thought. The new machine cannot be that bad, can it? Have I missed some cache setup? Frame buffer can’t be cached, right? Why was linux frame buffer console faster? Finally I found a forum where Bare Metal guys were discussing their great efforts to develop standalone software for RaspberryPi. Luckily for me one of them had similar issue I had. He also led me to the final solution. It turned out, that the CPU cores of RaspberryPi2 are not silently seeping and waiting for an interrupt when start.elf transfers the control over to the ARM cpu. No, instead they are busy looping and polling the registers, anxiously waiting to start and do some useful work. As you can imagine polling technique is not something very effective, it’s rather the contrary. The additional CPU cores were stealing the precious bus cycles, leaving less for the CPU#0 which was actually running AROS code. Eureka! It forces the additional CPUs to go sleep and wait for interrupts instead of do busy looping. I tested it and it really helped. After adding that line AROS really flies on that tiny computer! 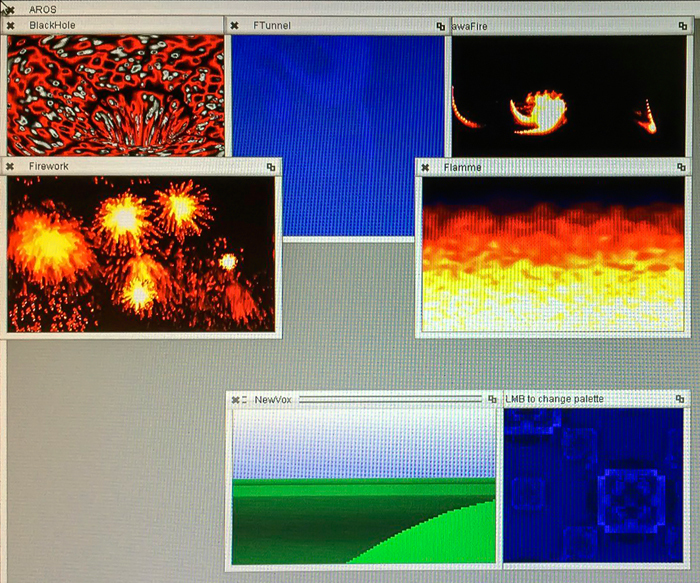 Frame buffer refreshes quickly, display redraws quickly, few demos redraw their windows nearly immediately. Boo! Now the machine not only feels faster than old RPi, it actually is faster. Eons ago I was involved in several ARM-related projects. One of them was to make a linux-hosted port of AROS for ARM devices. These were the days full of fun and joy (if everything worked well) and frustration (if everything failed). After that my engagement in AROS dropped nearly to zero. There were, of course, some exceptions like improvements in memory management (TLSF support) or improvements in x86_64 AROS. But none of them were as low-level as I wished them to be. Since at work we started to use some ARM-based embedded machines for our electronics, I had some fun with coding them. Not really low level, but weird enough 🙂 This all drove me to an idea of buying an ARM platform and make native AROS for it. Even if there are better machines available, I have decided to support RaspberryPi. 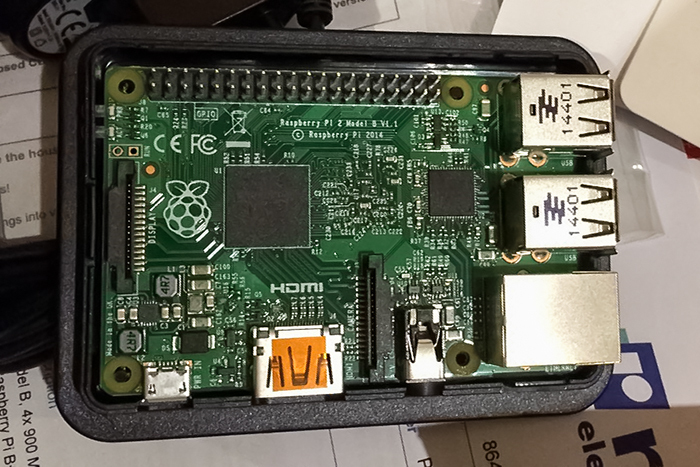 One of the reasons was availability of the rPi code in AROS repository – our great developer Nick Andrews has started a port of Aros for that machines already and made a great progress with it. Another reason, a very important one, is a huge community behind Raspberry. During last weeks me and Nick had fun with bringing AROS port back into usable state, rewriting it and improving in many places. Code which was initially not working with rPi2 boards at all now boots equally good (or equally bad) on both rPi and rPi2 into Wanderer, the desktop environment of AROS. The kernel of our system is loaded at a virtual address 0xf8000000. The read-only portion of the kernel is MMU-protected again writes. All caches and write buffers are enabled. Slowly all bits and pieces are improved and we are doing our best to get USB on-the-go up and running. Having it would allow us to actually use Aros on these nice machines already.